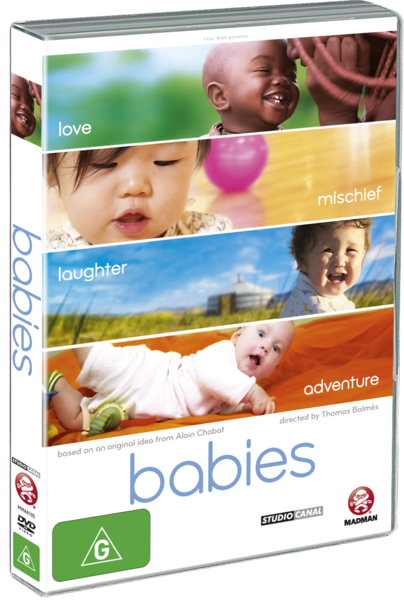 Babies DVD Review Babies takes documentaries to a whole new level and Balmés should be commended for creating such a joyful documentary about one of the world's most powerful elements, the life of a child. This interesting documentary by filmmaker Thomas Balmés that is based on an original idea from Alain Chabat follows the amazing journey of four babies from around the globe that include the Namibia, Mongolia, Japan and America. However what's amazing about this documentary is that the presentation is non-narrative which has allowed Balmés to focus on the raw emotions of these babies within their first year from birth to their first steps. It is also enhanced by the cinematography and the sounds of the babies and their families to create a rather unique and interesting journey. Even though the babies are worlds apart and the cultures highlighted in this documentary are quite diverse, on an emotional and human level, we are all the same which makes this presentation such an emotional and colourful presentation. The babies in the question, include the super cute Ponijao, a male baby from the Namibian Savannah, Mari, a female Japanese baby from a Megalopolis, Bayar, a girl from the Mongolian steppe and Hattie, a female child from San Francisco California. Balmés also ensures that the camera work makes it like you are part of their family as you are taken on their journey from birth, to their first steps and the bonding between various members of their family. For the most part, Babies will put a big fat smile on your faces as many of the scenes with children are quite amusing and Balmés ensures that he tugs at your emotional heartstrings as you watch these children learn to interact with the world. More importantly, even though all children are from different socio-economic backgrounds and cultures, the common theme that Balmés highlights here is that the love from their parents are equalled, providing that their children have the nurturing and attention needed to survive in this sometimes harsh world. However, it is interesting to see the contrast between non industrialised countries such as Namibia to that of San Francisco and even though the methods of child bearing and raising may be different, it all comes down to the powerful bond between the parents and their baby. Babies is a very primordial and emotional journey that is made more interesting by the removal of the narrative track as only sights and sounds are used. Video quality is presented in widescreen with vibrant colours and sharp images with a minimal amount of errors. Audio is presented in with a 5.1 track that contains extremely clear audio that is complimented with an enjoyable soundtrack to highlight the stories and themes of these babies. For special features, the documentary contains a featurette called "The Babies - Three Years On" which revisits these families and it's great to see these children more grown up and established as little individuals. The theatrical trailer is also included, however it's nothing to write home about. Babies takes documentaries to a whole new level and Balmés should be commended for creating such a joyful documentary about one of the world's most powerful elements, the life of a child.